Scarlett Hall lives in a home with her husband and three children. As such, she’s seen some surprisingly large bills before, but those are generally in the hundreds of dollars range. However, her most recent electric bill was a bit higher, and by a bit higher, I mean a billion dollars higher than what she expected. Scarlett Hall got an electric bill charging her for $1,016,500,130.09. 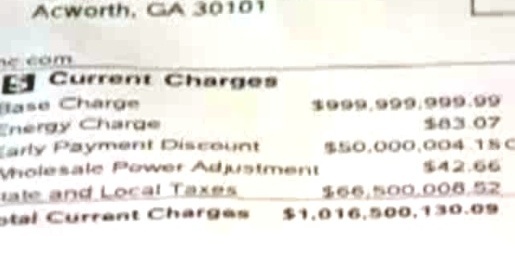 Fortunately for Scarlett, that massive bill wasn’t her actual bill, but a horrible billing mistake on the part of Cobb Energy, her local utility company. Her real bill was a more modest $287, which her utility company put right the moment they discovered the error. Budget crisis averted!